Hi makers! 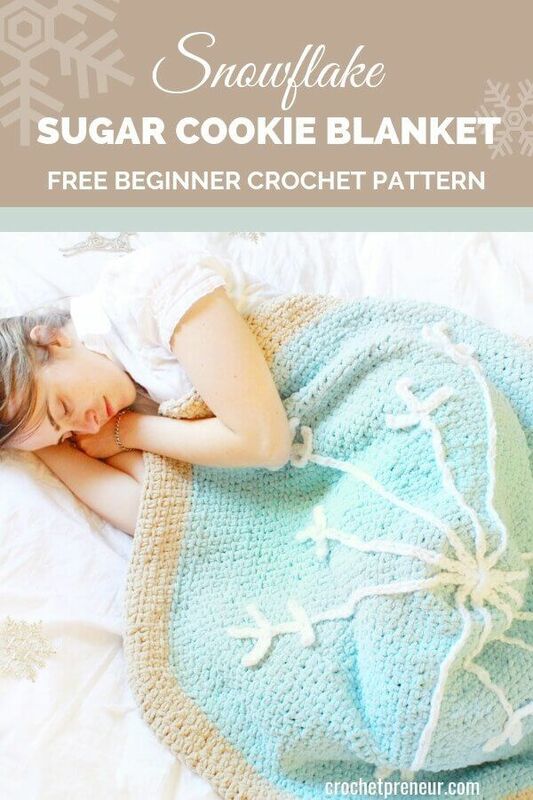 I am so excited to bring you my Snowflake Sugar Cookie Blanket that I made especially for the Crochetprenuer Blog. All of my designs are inspired by my love of food, cooking, and baking, with this design coming from all of my memories of baking sugar cookies growing up. It’s super soft, sweet, and almost looks good enough to eat! I can’t wait to snuggle with this blanket by the fire this holiday season, and I hope you enjoy snuggling with it as well. The free pattern, below, includes instructions for the child size blanket. Want to make a bigger blanket? Check out the downloads section for the premium patterh which includes instructions for an adult size blanket with photo tutorials for the snowflake! Follow along with the free child-size pattern, below. Purchase the premium PDF including instructions for child and adult size blankets and a photo tutorial for snowflake construction on Etsy or Ravelry. Magic Circle = A technique used for amigurumi that creates a loop of crochet stitches. This pattern is worked in continuous rounds with no joining from the top down, with the blanket made in one piece. Snowflake sewn on after the cookie blanket part is finished. The Snowflake is made in 5 separate pieces that are sewn onto the Cookie after you’re finished crocheting it. Fasten off, weave in ends, and make the snowflake. Repeat this on the side of the chains with the slip knot by slip stitching into the first chain. To attach the snowflake pieces to the blanket, position them how they are in the picture above. Position the long pieces so that their points are lined up with the curves of the blanket. There are six curves, so each side of the long pieces matches up with one curve each. The small pieces go in between the spaces of the larger ones as pictured. Sew pieces on after positioning them. I position one at a time, and then sew it on. Weave in ends when finished. I know you’re going to love making the Snowflake Sugar Cookie Blanket and I so look forward to seeing your finished product. Claire Goodale is the designer and maker behind E’Claire Makery. She has been crocheting since she was 7 years old when her Grandma taught her on her couch one winter evening. As soon as she picked up yarn and a crochet hook, she was completely hooked on all things fiber. This drew her to learn crocheting, knitting, weaving, cross stitching, embroidery, and the list keeps on growing. She loves creating cute and cuddly things that make people smile, and her goal is to help people have no fear in making so that they can make the handmade items of their dreams. Besides all things fiber, she loves her husband, Stephen, all things superhero, hiking, getting lost in a good book, her plants, cooking, baking, and anything creative.